It’s a New Year and the celebrations are behind us. But wait, are they really? Your birthday is a big deal, right? After all, it commemorates the day you came head-first (well, most of us anyway) into this world to begin making an impression. But you know an even better reason for a party? The birthday of your business. It’s a celebration of all the impressions you make. The SBA reports that about two-thirds of businesses survive 2 years, half will survive 5 years, and one-third will survive 10. Another report estimates that only 4 out of 100 business survive the 10-year mark. If your company is a decade or more old, then congratulations, you’re one of the 4%! Now that’s cause for celebration! ore surprised by the amount of time, effort and money went into properly celebrating this event. Are you introducing a new product? Are you using this as a marketing event? Or is it simply a celebration of a milestone? We wanted to pay tribute to my mother and father, who started the business in 1966. 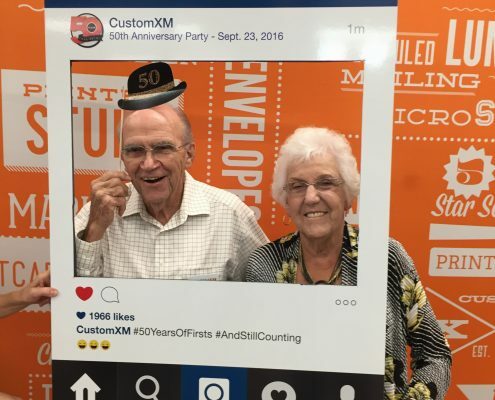 Family members, former staff members, long-time customers and suppliers gathered to reminisce about the early days of CustomXM. While it became a marketing event, the primary purpose was a celebration to honor of my parents. Additionally, it was an opportunity to highlight what we now offer in the way of promotional items, wide format, and new printing options. For any event, the list of invitees is critical to its success. Consider your objectives in determining who gets invited. Your invitation is the perfect opportunity to showcase your work. Get creative! Do you have new capabilities, products or services? Be sure to combine online, email and direct mail invites. And don’t forget about social media. Use all your tools to get the folks to attend, while at the same time displaying what you can do to help them in their business growth. We used a mix of old school and new technology for our invitations. Facebook, email, and evites helped spread the word economically. And of course, we had to “dance with what brung us” by using direct mail – postcards, formal invitations. It was a good cross-media mix. It’s not a proper party without cake and food. We catered in catfish and chicken, and had a special 50th Anniversary cake created by a client. Keep in mind your budget for this event – it’s easy to get carried away with the food, the fun and the giveaways. Like any project – create a plan and a budget – and stick to it! Forget about Party City – this was our opportunity to show off a bit. Signs, banners, floor graphics, personalized name tags – show’em what you do and how to use it. If you have the space, parking and environment, an on-site event works great. We chose to go off-site to the newly opened co-working space at the Innovation Hub. Wow, what a nice facility! This gave us more room for roaming. A birthday celebration without party favors is hardly a party at all. We made sure our guests did not leave empty-handed. 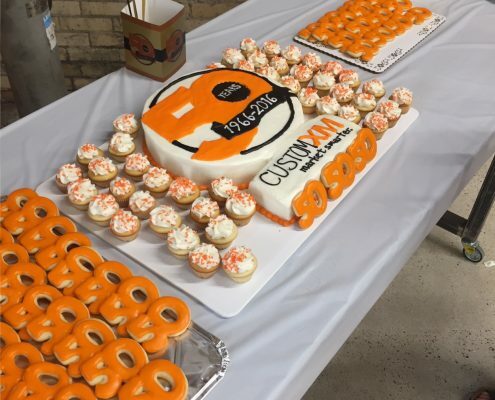 We took advantage of our promotional products offerings so that we could shower them with appropriately branded tumblers, thumb drives and even pizza cutters. We included a photo book entitled “50 Years of Firsts” that told our story and included images from way back when. The point is – yes, give stuff away – stuff with your name on it – and your guests will love you, and remember you even more. Games? Clowns? Pony Rides? Maybe not at this party, but our guests seemed to have plenty to enjoy. During our event, we broadcast music from the 60s (since we began in 1966) and played a video that recalled our 50 years in business, with the highlight being interviews of my mom and dad sharing stories of the days of old. When all was done, we just didn’t seem to have enough time to spend with everyone. That simply means we must do it all over again, and soon. Although our industry has survived since the mid-1400s, every year we remain open is another reason to celebrate. Congratulations as you celebrate your next trip around the sun! Let us know if we can help you celebrate in style!